This guide is designed to help you send the correct details to HMRC via RTI to inform them that you wish to close a PAYE scheme. You should first read the HMRC guidance www.hmrc.gov.uk/payerti/business-close-or-change.htm which gives full details of the information you are required to send. Before proceeding you should double-check that all pay has been entered for each employee – you will be declaring that this is the final RTI submission for the year to HMRC, so it is important that you are satisfied that everything is correct before doing so. Each employee should be given a leaving date to reflect their final payment. Click ‘Employees – Employee Details – Work’ to enter this information. You should issue each employee with a P45 – click ‘Forms – Employee Leaving Statement (P45)’ to produce these. The leaver information will be included on the next avaialble FPS. You should file this FPS at the normal time (i.e. on or before the pay date) before moving on to the next stage of this guide. HMRC ask that you provide the ‘date scheme ceased’ in the RTI submission. 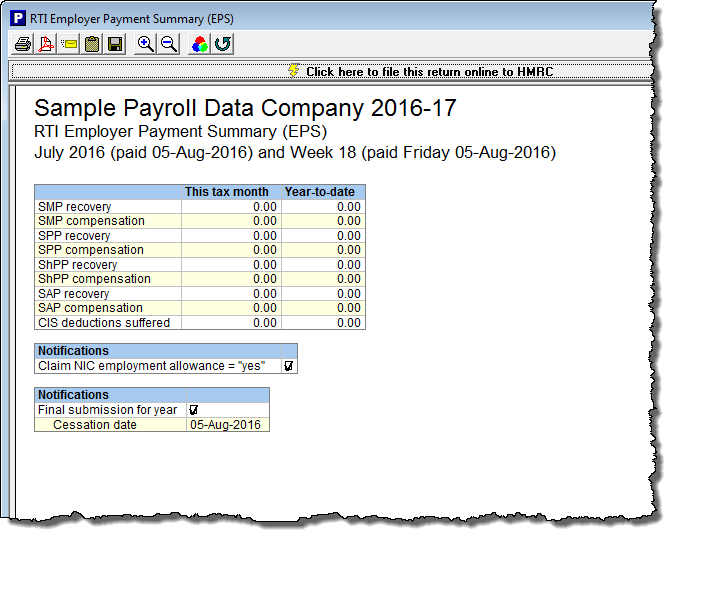 You can enter this by clicking ‘Employer – Employer Details’ and making an entry in the ‘Date PAYE scheme ceased’ field. IMPORTANT: You must ensure that the cessation date you enter is after the due date for the last RTI return that you have already filed (see above), otherwise HMRC will effectively ‘ignore’ the date and assume that the PAYE has been re-opened. This may then result in HMRC fining you for non-submission of future returns. e.g. If the due date of the last FPS that you filed was 30 October, then the cessation date that you enter must be 31 October or later. An EPS will also be generated showing the cessation date. 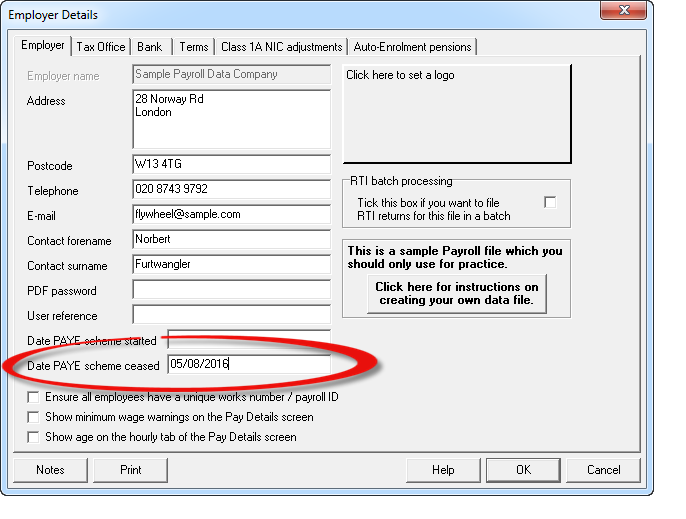 This video shows you how to close a payroll scheme. This video was recorded WITHOUT sound and in High Definition. Click the button in the Youtube player to select the best quality.